These Praying Hands are a great reminder to give thanks for your many blessings. 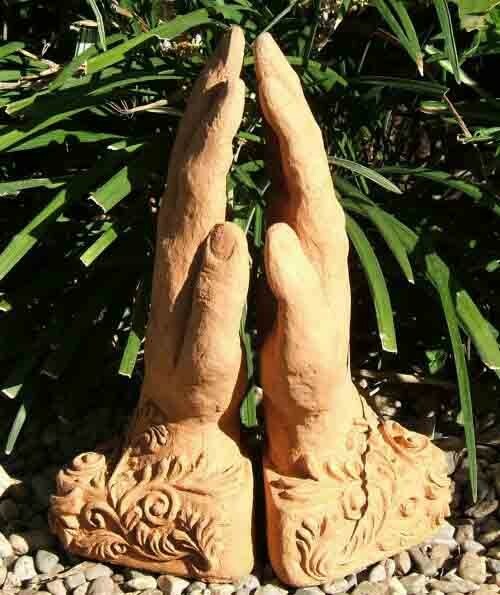 A pair of Praying Hands are at home out in the garden or inside as a decorative accent. Place them on the fireplace mantle holding your favorite literary titles or on the kitchen counter squeezing your cookbooks together. Some use these special hands to dangle jewelry or just use them as a reminder of prayer. Symbolic, functional and practical, maybe they should be used to squeeze The Good Book. Hand crafted in America of solid cast-stone (concrete) and made with integrated coloring. Each pair of Praying Hands is sealed for years of worry-free outdoor use. Makes a great gift, too! 10 tall by 7 wide and 7 lbs. Color: Sedona. Original garden art by Michael Gentilucci.